Another edition of the IARU HF World Championship is over. 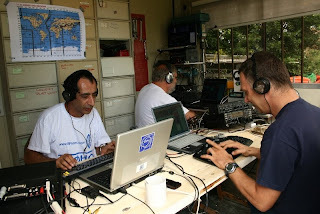 I am just back from Bordeaux where at the fantastic F6KNB site and together with Phil - F6IFY and Pat - F6IRF we took part in the 20m CW team. 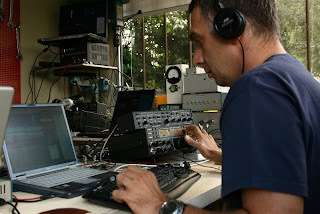 There were two more "band-teams" for 40m SSB and 10m CW on the same site. The F6KNB boys had done a tremendous preparation to host the three bands on their site. 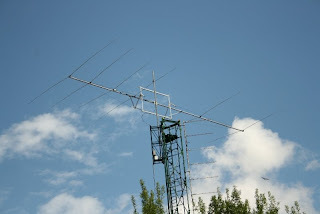 For the 20m part, they constructed a six element yagi on an 18m long boom, that was installed on their 30m high tower. This antenna came as an addition to the 5 element one, installed some 40m west of the new one and at a 12m high tower. You can see above how the 20m CW operation was organized. Any of the two positions at the forefront could take the run, the third one serving as support or in-band multiplier hunting. During the calmer hours and especially the second day, it was possible to hunt many precious mults. Photos are courtesy of David - F4DVX. Once the K3 project was built, time was to investigate the softrock lite specifically prepared by Tony - KB9YIG, for the K3 IF. Building the kit is easy with a fresh pair of eyes. But even then, a magnifying lens is a must. Jack - K8ZOA has made an excellent work to provide an isolating amplifier Z10000, to ensure that a minimum signal from the softrock oscillator is fed back to the K3 mixing stages. I did add to it a bandpass filter, the Z10010, built and tuned by Jack, to eliminate frequency products out of the IF bandpass (400 kHz). Jack's site has a wealth of information on many subjects. His articles have a rarely met attention to detail and completeness! Thank you Jack for sharing all this! On the left side is the softrock lite and othe right side, the Z10000. Both kits Z10000 and softrock lite were built over a weekend. I put both PCBs in a small housing and attached together the bandpass filter box. I put a post placeholder of the photo album with the assembly of my Elecraft K3. It took me two days assembling the rig. Very clear instructions and an excellent thought out arrangement, made it a pleasure to build it. Congratulations to the Elecraft team.! Nice surprise from the postman today. A brown envelope sent by Tony KB9YIG contained seven small envelopes full of components of the 30/20m kit. It took only 4 days! BOM and inventory were done. Time to warm up soldering iron and sharpen eyes after a month's absence. This blog is dead !